The energy I felt as I returned from my hike plummeted as I realized I could not find my driver’s license anywhere. It wasn’t in the car, in my purse, in my home office, at my work office, or any place it could reasonably turn up. It’s okay, I thought to myself. I’ll get it back. I must have lost it on the hike. Someone will find it and send it back to me. Six days later, my mailbox still empty, I decided on a whim that the most productive thing I could do was go down to the DMV myself and get it taken care of—even though I had already scheduled an appointment with them at a later date. Granted, that later date was weeks away, and so, not feeling safe without my ID, I grew impatient. I rushed. I wanted to take action. I wanted a solution. Now. I came home after 4.5 hours at the DMV office to find my original license waiting in the mail for me, as I hoped it would be over the last few days, with the above note attached. I was moved. I thought, If only I had hung in there a moment more through the night…Morning was sure to come. As I reflect on what happened to my trust, my faith in God/human kindness, I am reminded that, often times, the best things to happen to us are things we wait for. My gratitude swelled when I read the note, despite my having lost a whole day to “taking care of it myself” and impatience at the situation. Like most of us, I tend to want to move fast in my life—or rather, the things I want, I want now. I am, after all, human. But this was a beautiful moment for me, a reminder that trust and patience in the process have dividends too, sometimes just as big, or at least as meaningful, as my “go-get-‘em” attitude and approach to life. 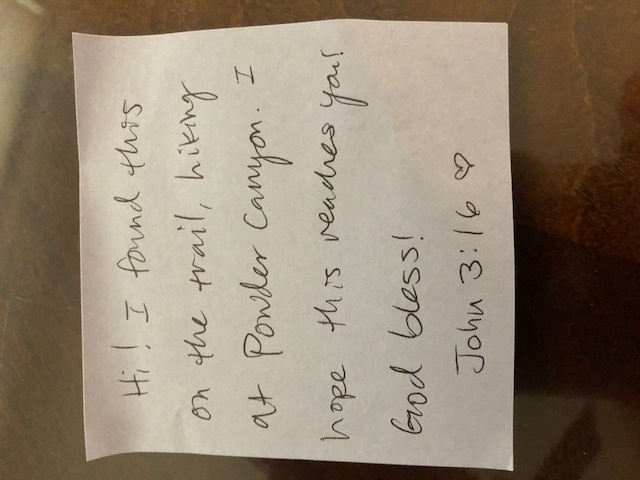 I wish there had been return address on the envelope so I could share with this person how deeply touched I was by his or her kindness—how humbled I was knowing that someone out there, a perfect stranger, was looking out for me. It’s a strange feeling, one that I, like many of us, do not experience often, least of all, often enough. I hope I can return to the favor to someone else in need someday. To the person who returned my license: Thank You! The gesture meant more to me than you can know.